Stunning Keisha: Easy On Sunday—WINNING! Yesterday was a big day for me. I'm sorry I didn't get to visit with furrends but I'll make up for it, I promise. 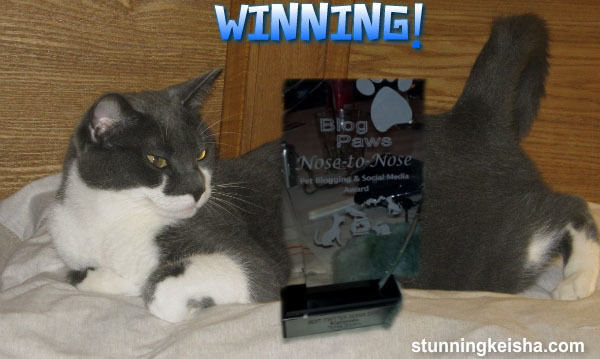 You see I WON THE BLOGPAWS NOSE TO NOSE AWARD for TWITTER DESIGN. Yes, this stunning ittle ghetto kitteh is now sporting some heavy-duty hardware! Woot! Now I know what Beyonce feels like when she wins all those Grammies! I was sure busy what with the phone calls, the innerviews, the photo shoots! Everyone wants a piece of me and you guys can say you knew me when! This is gonna look great in my trophy case—and the peeps better BUY me a trophy case. I've earned it. How about this award! Dunno why they had to put TW's name on it too. It was all ME. We were Live Streaming and what a roar went up in La Casa Keisha, as well as at Blogpaws when my name was announced. Thanks to all my furrends in attendance that believed in this kitty from da hood. I especially want to send a shoutout to my homey @MaggieTKat, who called the minute I won, and to @BoSoxAmy, who saw me hitchin' and graciously gave me a ride to Salt Lake City and cushy accommodations. And I can't forget Glogirly, who designed my winning Twitter page! You guys are the bestest. I'd like to thank Blogpaws and Halo Purely for Pets for recognizing this little ghetto kitteh. I'm accepting this award for all the ferals, strays and shelter cats, who haven't yet found their furever homes, and are not s lucky as I am. I feel like I've revolutionized cats on Twitter. When I first logged on back in May of 2009, all the cats I befriended were sweet, cutesy and submissive. Since I came on with my brashness and always keeping it real attitude, more and more have imitated me, thank Cod. Everyone knows most cats aren't lovable and sweetness, but we're independent. We take no prisoners and we bite the ones we do take. What, besides this cool piece of hardware did I win? My charity, A Call 4 Paws, will be getting 5,000 bowls of pet food (and I'm sure Linda digging on it cos it's grain-free)! My furrends at the cat sanctuary will be having dinner on me for a few weeks. I heard from Linda last night and she's as THRILLED as I am! AND, if all this wasn't good enough, I found out that my sisfur for a day, Isabel, now has her own furever home and is thriving! Oh CK, that is so exciting and no one deserves it better than you. We need to get out mom off her duff and learn how to do Twitter. She is such a doofus. We are very excited that you won that. Good job. Have a great day. Concatulations!!! What a pawsome day. We too, have got to get the Mom to start twittering. She's lazy, be we love her. MOL! CK, our mom was watching the live stream last night and she cheered when your name was called! Congratulations, girl! We're so proud of you! Y'know, we're on Twitter, but we hardly ever tweet anymore. We gotta do something about that!! Twitter, schmitter. Mom Julie's cutting back on all her social networking lately. I guess I'll have to pick up the slack. Ok I'm confused...should I be congratulating Glogirly or you???????? Congratulations for having enough sense to have Glogirly design your winning Twitter page!!!!!!!!!! There ya go!!!!!!!!! Congratulations to BOTH of you, so in affect, Glogirly got two awards!!!! That's waaaaaaaaaaay cool!!!!! Concatulations!!!!!!!!!!! Concats to you CK! Your twitter page is awesome and we are very happy for you and all the Halo you won for A Call 4 Paws! This is totally fantabulicious...now we want to know, can we have your pawtograph? Even though I knew you when CK, I always knew you were a winner! Congrats girl! CK me thinks yous a winner EVERY DAY! And that yous was recognized ny BlogPaws for your Twitter design...Spectacular! Me is so happy to knows yous! PS Kozmo says yous is one HOT Kitty! Big concatulations, CK!!! My human really wishes your human could have come - she had lots of fun with everyone who did make it! Great news about Isabel, too! Wow, CK. I dunno--will you still be my LadyCat now that you have that Fancy Award and all I gots is some fev-ver toys??? Could I come over later and see it??? Pretty awesome! Can we still be your friends? Concats CK. You certainly deserve to win for all the hard work you do! Wow! Congratulations! You won big time! Not only for yourself but for all those needy kitties. Well done! I see you've been busy, but I have an avatar of Cathy Keisha on my blog right now for you to copy. Go to: http://wendys3-dcats.blogspot.com. It's at the end of today's post. Hope you like it. Darling, I will come visit you now AND later when the real deal arrives in the Garden State ;-) Have you prepared its special spot of honor? I'm SO glad you won, CK!!! When they called your name, Flat Katie was bouncing high in the sky. Even Gloman saw me popping up above the crowd! ...And just to be clear, the award is not just cuz you have a fabulous twitter background...it's because of all the amazing things you've accomplished on twitter. All the anipals you've helped and inspired. This one's for YOU, CK!!! Can you hear me screaming all the way from Sweden ??!! ConCAtulations to the Nose to Nose award ! FaRADaY: Woot! Woot! CONCATULATIONS!!! We think Glogirly did a PAWESome job of designing your twitter page! ANd concats to A Call for Paws too! oh my! I thought I had already dictated this comment, but staff failed again! She claims she has art-right-is, but come'on! How bad can that be??? So, concatulation CK on the award you so deserve. Congratulations! Little ghetto kitteh makes it big...as it should be.